The Men in khaki are reaching out to netizens on Facebook and in the recent fortnight in a very proactive and blistering manner. 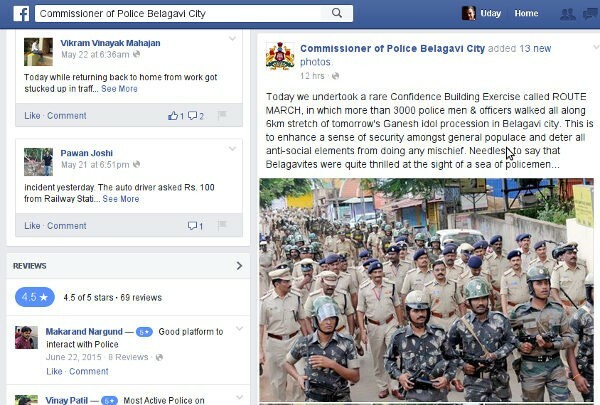 Currently the Commissioner of Police Belagavi page has 4691 Likes which is a handsome number and the number of followers have increased after the the posting frequency on the page has increased. However the posts made by citizens are moderated not made public but there are good amount of comments on the information shared by the page. Twitter and Facebook has also given a sense of pride to the people that they can reach out to the often unseen policemen with their tweet or even upload a picture to the FB page. On earlier occasions the Facebook pages launched by the Police did not get this kind of response. The first Police page was created by the then SP Sandeep Patil, then a dedicated Traffic Police page was also created but all died out soon with no posts from the latter. In the world of Social media a page is successful if there is a conversation of sorts, in this case at least the authorities are sharing information round the clock which is making the citizens feel better as they get information from the official sources. The Twitter handle is @COPBELAGAVI has 210 followers but here again the feed is synced with FB page which is automated and no replies from the handle as such, which needs to be looked into. We wish page a great success and hoping to see the Commissioner of Police page also respond to some posts made by citizens.